We are holding another audition session for LNTG’s next Production: J.B. Priestley’s “I Have Been Here Before”, Directed by Sonia Chapman, and Produced by Andy Kerr. Auditions are open and require no prior preparation. Innkeeper and Father of Sally Pratt. Stout, warm, humorous, contented Yorkshireman in his 60s. His accent is broader than his daughter’s but not too broad. Actor age can be flexible, so long as he can feasibly be Sally’s father. An age range of 40-70 yrs would work. 28-30yrs old, good looking and charming, with something of the boy left in him and something of the intellectual man. He has a decisive, slightly donnish manner, although not so much with people for whom he is on pleasant and easy terms (e.g. Sally & Sam). Schoolmaster of Lamberton School, but is currently off work, having been “ordered a short rest” (it is not entirely clear why he is off work). Farrant is staying at the Inn and feels at home there. Actor age needs to be within 28-35yrs so that he is younger than Walter Ormund, and same age or slightly older than Janet Ormund. Attractive, sensitive woman about 28 yrs old, Wife of Walter Ormund. She is troubled as soon as she arrives at the Inn. There are also issues within her marriage which remain a mystery, but are clearly a source of stress for both Janet and Walter. Actress age needs to be mid-20s to early 30s. Biggish man in his early 40s, whose manner alternates between alert, sharp command, on the one hand, and a gloomy brooding, on the other. There are problems in his marriage with Janet. He is a workaholic and drinks a lot. Actor age to be in 40s. 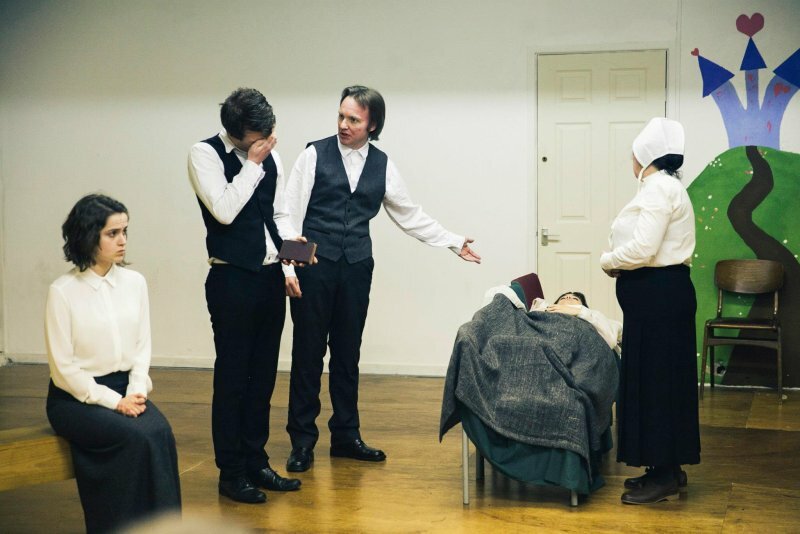 ‘I Have Been Here Before’ is a play in three acts, set in the sitting room of the Black Bull Inn, Grindle Moor, North Yorkshire at Whitsuntide in 1937. 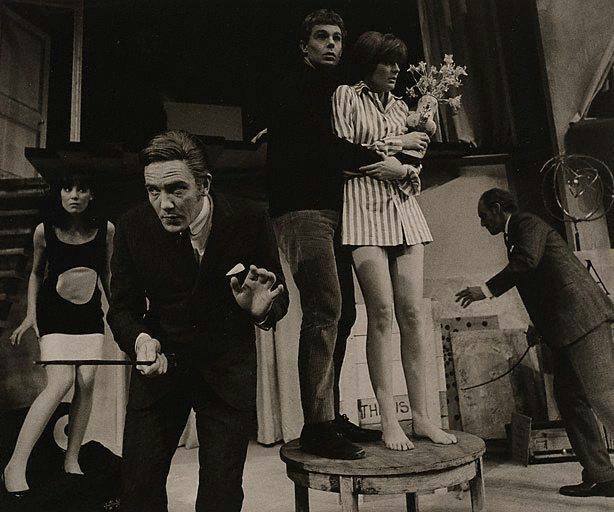 There are 6 characters, the Innkeeper: Sam Shipley, his daughter: Sally Pratt, a German Professor in Exile: Dr Görtler, a local school headmaster: Oliver Farrant, and a married couple: Janet & Walter Ormund. Aside from Sam and Sally, all the other characters are guests at the Inn. The play is an existential brooding drama, centred around a theory that we repeat our lives constantly in a sort of spiral. We make the same decisions again and again, and can break out of the cycle once we realise and understand the forces that govern us. Dr Görtler has come to the Black Bull in to intervene in what he knows will be a love affair leading to suicide and poverty. Please RSVP on the Facebook event, or contact Sonia Chapman – PM or chapmansonia@gmail.com. 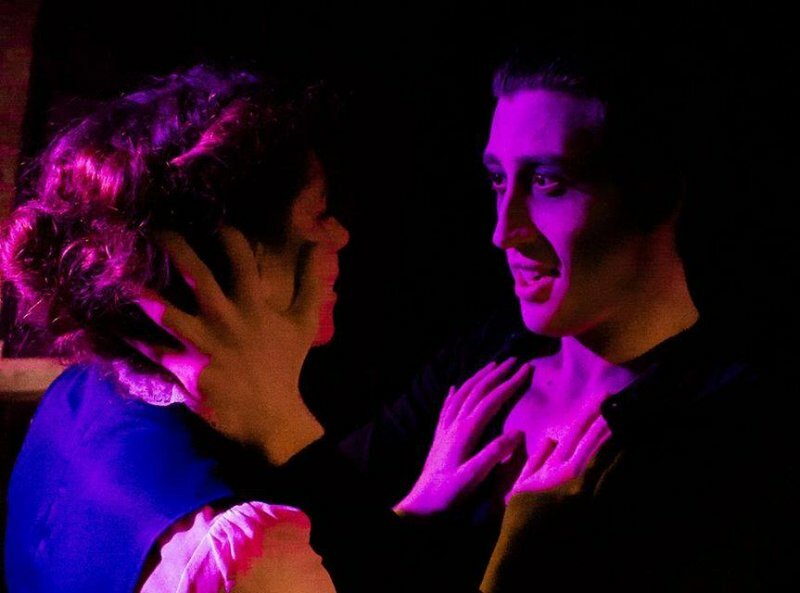 Tickets are now on sale for Liverpool Network Theatre’s Peter Shaffer double bill in February. “White Liars” & “Black Comedy” are two one-act plays by the acclaimed author of Amadeus and Equus. Tickets for Humble Boy now on sale! 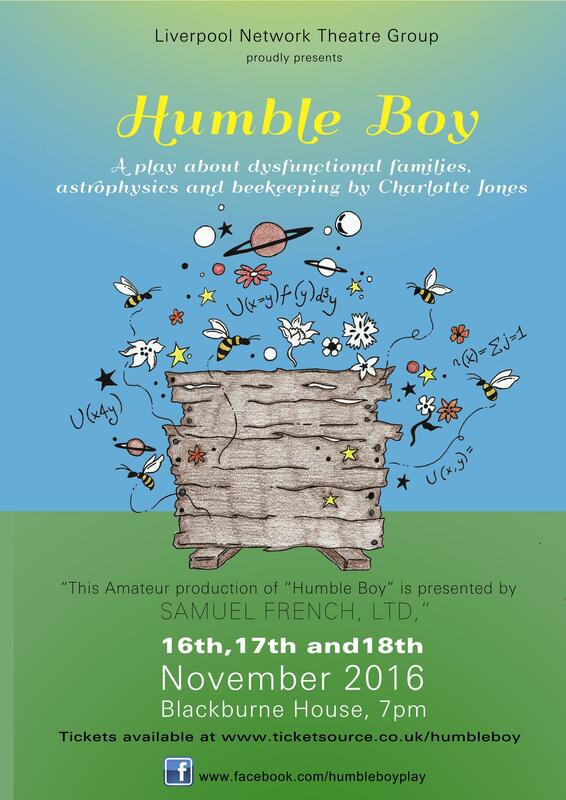 Liverpool Network Theatre Group are delighted to present ‘Humble Boy’, the award-winning play (2001 Critics Theatre Award for New Play) by Charlotte Jones. 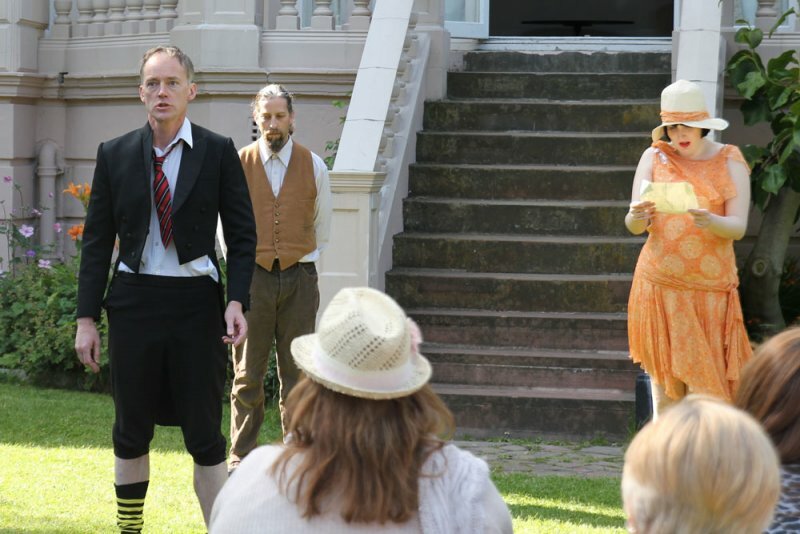 Take a stammering astrophysicist, add his waspish mother, her boorish beau and his free-spirited daughter, sprinkle with a nervous family friend and garnish with a wise gardener. Place all in the warmth of an idyllic British summer and watch the desperately cultivated veneer of civility disintegrate deliciously. Humble Boy is a gorgeous celebration of language and the madness of life, like the bees that buzz in Felix’s head even though they have been banished from the beehive. It is thematically rich and boldly theatrical whilst remaining uncompromisingly and intimately human with plenty to think about once the sun has finally set on the Humbles’ garden. Blackburne House’s cafe/bistro and bar will be open throughout the evening and offer a pre-theatre menu which can be booked either on 0151 708 3929 or via www.blackburnehouse.co.uk. In addition, there is a 10% discount on all food purchased directly at the counter. Open auditions for the next Network production, a double bill of plays by Peter Shaffer, will take place on Wednesday 26th October between 6 and 9pm at our workshop venue, Hope St Ltd on Lord Street (entrance between McDonalds and Specsavers, ring bell for 3rd floor), with rehearsals throughout December and January. 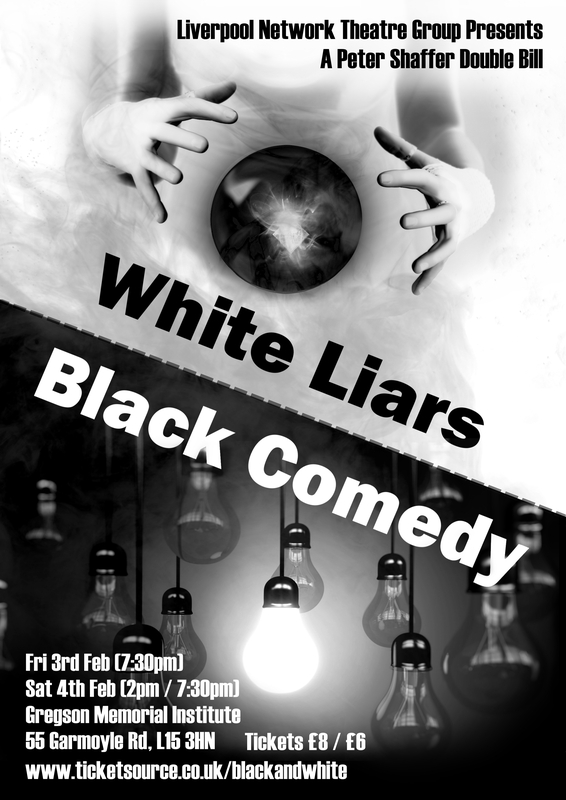 Black Comedy: This hilarious farce plays on light and dark: when the lights are ‘on’ the stage is pitch black, but after a few minutes there is a power cut, the stage lights come on and the audience can see the actors. Brindlsey Miller is an unsuccessful artist whose big chance has finally come, with a visit from eccentric millionaire art collector, Georg Bamberger. There are just a few problems to overcome: being engaged to Carol without having properly ended things with previous girlfriend Clea, the first meeting with Carol’s terrifying military father and having ‘borrowed’ his possessive neigbour Harold’s furniture to spruce up his flat. And then the lights go out. White Liars: Sophie, Baroness Lemberg, is a disillusioned fortune teller in an out-of-season resort. She is visited by Tom, the lead singer in a rock band, and his business manager, Frank. It soon becomes clear that Frank has an ulterior motive in the visit, but as Sophie looks into her crystal ball it becomes clear that life really is stranger than fiction and all three have something to hide. Sophie, Baroness Lemberg: an Austrian fortune teller who has fallen on hard times at an out-of-season English resort. A classy and educated lady who feels her best days may all be behind her. Frank: young manager of The White Liars, a rock band. Frank is nervous and unsure of himself and has an urgent favour to ask of Sophie. Tom: the lead singer in The White Liars, Tom is fascinating and attractive, but highly superstitious and ready to believe in fortune telling in general. A Yorkshire accent would help here. Please note that we are a community theatre group and these are unpaid roles. If you’d like to audition for either or both plays, please email sandra.tschackert@googlemail.com indicating which roles you would like to audition for and if you have a preference in terms of timing. We will sort out a few different time slots and confirm nearer the date. 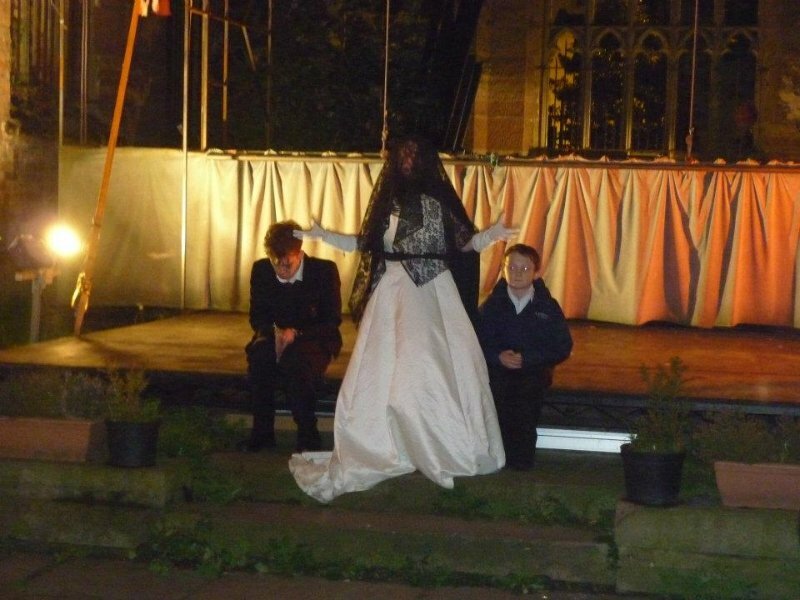 Humble Boy is Liverpool Network Theatre’s upcoming autumn production, and will take place from 17 – 19 November at the Black-E.
We are intending to hold auditions on Wednesday 24th August – (update:) upstairs at the Pilgrim pub on Pilgrim Street from 6.30pm onwards. – Felix Humble – A mid-30s theoretical astrophysicist from Cambridge. He is the play’s main character and most noticeable is his stutter caused by his nervousness. – George Pye – Confident, well-built, modern, and big band music savvy. George is the complete opposite of James Humble, the deceased father of Felix. – Jim – The gardener of the estate, he is an old man in his 60s. – Mercy Lott – Friend (although seemingly a slave) of Flora, she is kind but doesn’t seem to be all there. She has a secret crush on George Pye. See you at the audition! We are currently seeking proposals for plays to fill two slots. Firstly, our spring show, to be staged in late April/early May. Venue is yet to be confirmed, but will be indoors. As usual, we envisage three performances. Secondly, there is another opportunity for the first week of February (3 performances: Friday evening and Saturday matinee/evening). We are looking for a one-act play (or monologue) to form the first half of a double bill. The piece should be between half an hour and an hour in length. The venue will be the Black-E and we are looking for something light and amusing to fit in with the other play (more news very soon). Set should ideally be fairly simple, but feel free to submit any ideas you like. The initial deadline for proposals for both February and spring is the end of September. If you are interested in either/both slots, please send your proposals to liverpoolnetworktheatre@googlemail.com. We need the name of the play, the director and production manager (plus any other team members on board), any staging notes and why you think the production would be suitable for our company. If you need any help, then please feel free to contact us for advice and we will be happy to give you some pointers. Remember that we are always looking for new directors to come along and get involved. All of us started with no experience, so don’t be dissuaded if you feel your dream project may be too ambitious. BIG NEWS TIME! 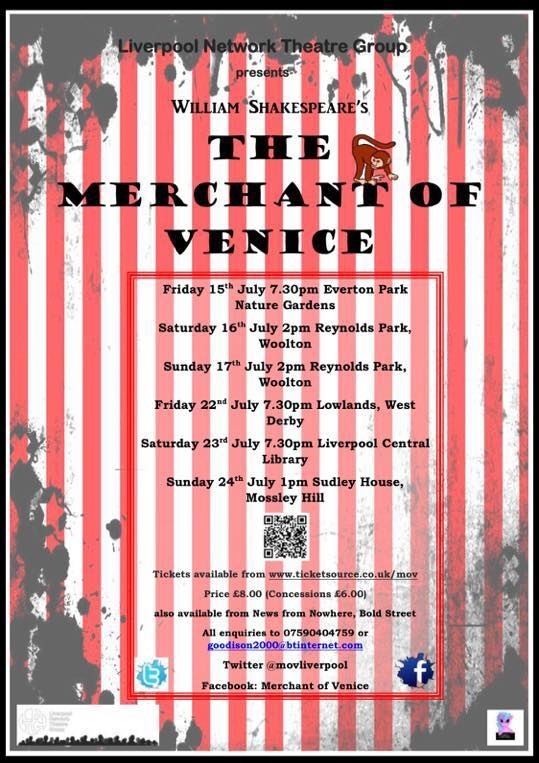 Rehearsals may be well underway for Merchant of Venice (seriously, I have sneaked into a rehearsal and it’s going to be terrific!! -Will), but LNTG has not got to its current position by resting on its laurels, so listen up! We are now taking proposals for our autumn show. Dates and venue have yet to be finalised, but we reckon November will be the most likely option. The initial deadline for proposals is June 10th, so get cracking and feel free to e-mail us or contact Will O’Neill or Sandra Tsch via Facebook if you have any questions. So hurry, while there are still spaces! Proudly powered by WordPress Theme: Twentyeleven Child.